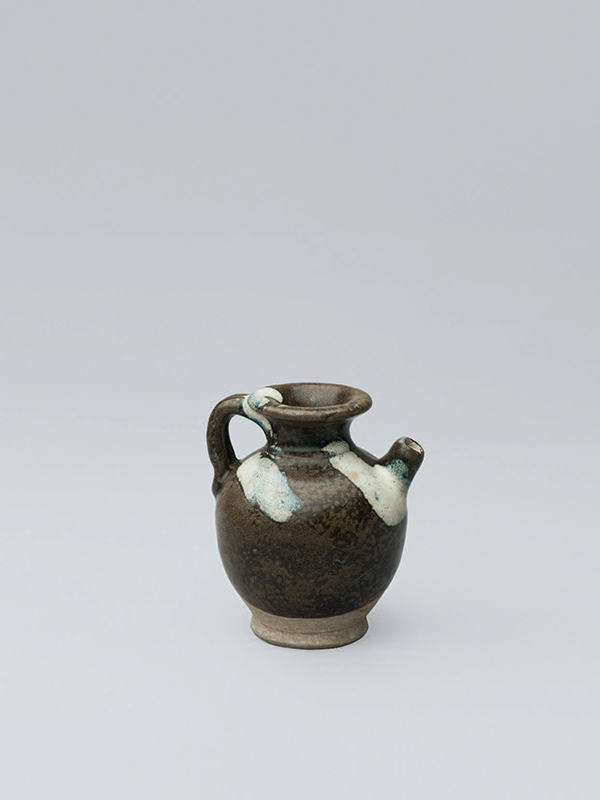 A miniature stoneware ewer, the rounded body supported on a short, flared foot. The short neck tapers upward and terminates in a flared rim. A double stranded loop handle connects the rim to the shoulder while a short, straight spout emanates from the opposite side. The exterior is covered in a yellowish-brown glaze that stops well above the foot, and milky-blue splashes are visible around the shoulders, the spout and the rim. The unglazed foot and slightly convex base show the fine and smooth greyish-white stoneware body. This elegantly potted vessel is a miniature form of the typical wine ewers of the Tang dynasty and a rare example of a scholar’s object from this period, functioning probably as a water dropper. Phosphatic splashed, black-glazed wares were famously produced in Henan province, notably at the Lushan and Huangdao kilns. It seems possible that this style of ware was inspired by ash-slag dripping from the insides of the wood-fired black ware kilns in the Tang dynasty — although, in this case, the application of the ‘splashes’ appears to be quite deliberate. A closely comparable black-glazed stoneware ewer of similar shape dated to 8th or 9th century of the Tang dynasty and covered in a splashed glaze, is in the Meiyintang Collection. Another comparable Tang-dynasty black-glazed ewer with blue splashes, of similar shape but larger in size, possibly produced in the Lushan kiln in Henan province, is in the Jiurutang Collection.